What, a new nail linkup? I saw this cute pix on my friend Amber's blog, Daydreaming Beauty, and I threatened convinced asked her to let me join. I was all like, nails? Where? Have you ever been to Washington, D.C. during the time the cherry blossoms are blooming? It's utterly spectacular, and it smells amazing. 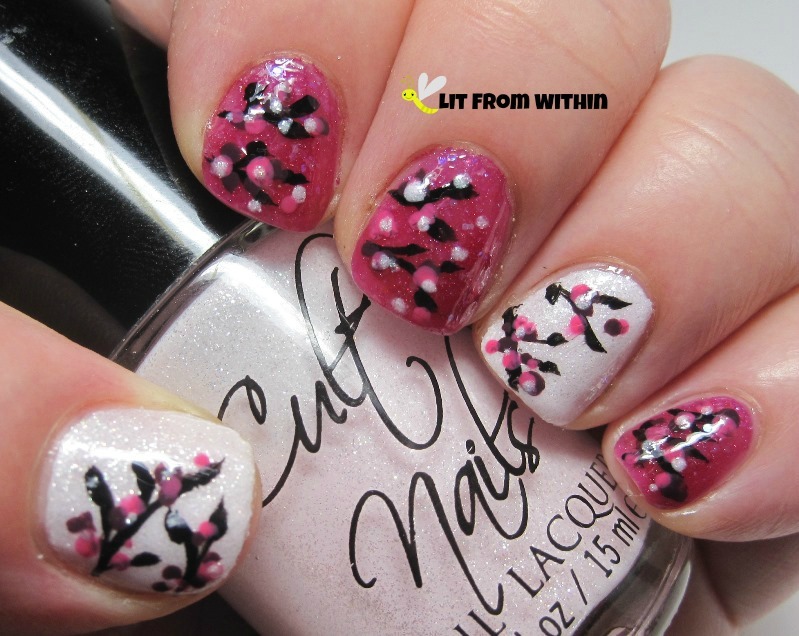 Inspired by that and many incarnations of cherry blossom nail art (including this one by the fabulous Kimiko7878 on Instagram) I came up with this. I started with Cult Nails Angel Whispers, a textured pale, pale pink, and Darling Diva Polish Rose Opal, a pink jelly with flakies. I used a black striper for the branches and leaves. I decided to do more abstract blossoms, with dots of polish. I used Sheswai Lacquers in Babe and What, and also did some highlighting with Angel Whispers. It almost looks like snow, instead of flowers! One of the benefits of doing dots instead of something more precise - you can do both hands, and they look like you totally meant to do dots! Bottle shot: Cult Nails Angel Whispers, Darling Diva Polish Rose Opal. Sheswai Lacquers in Babe and What, and my black nail art striper. I don't always do nail art on both hands, but if I do, I want everyone to see it! Look, Ma! Both hands! 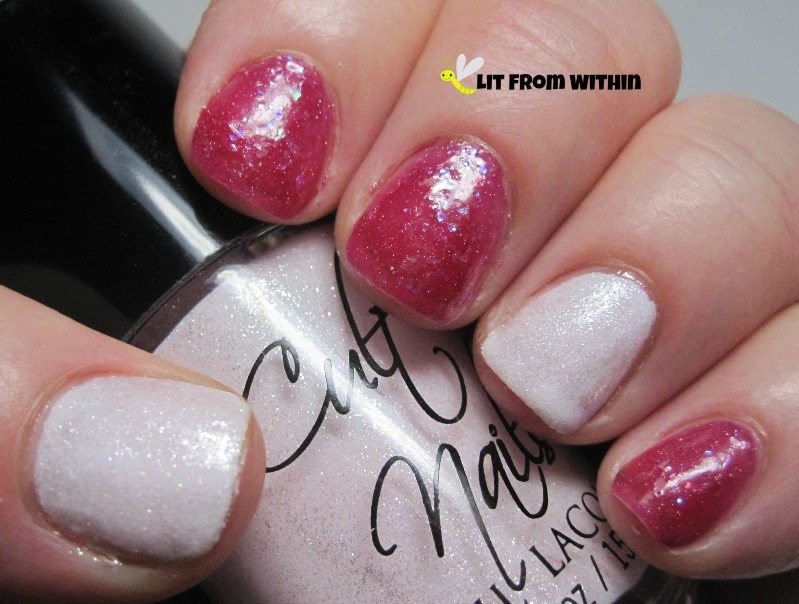 Check out The Nail Files to see who all is linked up this week! 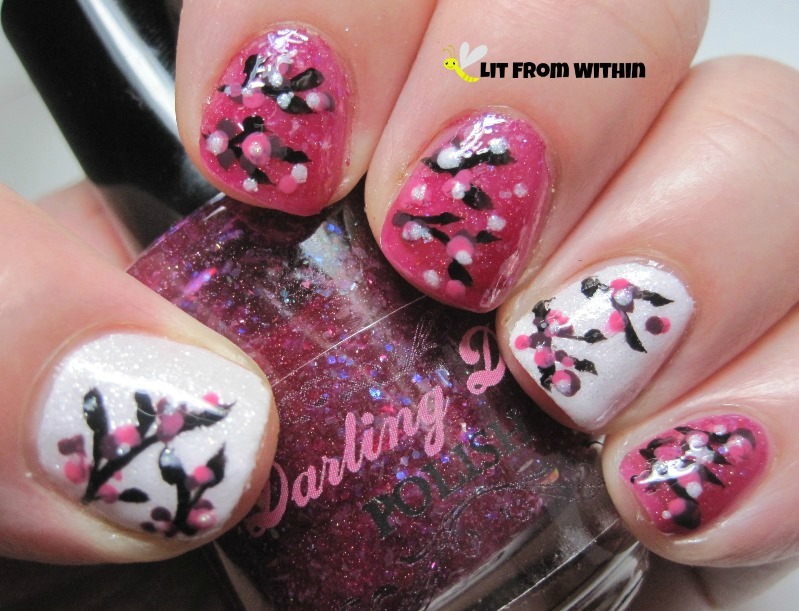 Love these cherry blossoms! I've been to DC during cherry blossom season but have never had the opp to really take them in. They are beautiful! Great timely nail art! Very pretty! & those Sheswai bottles look awesome! I love this one! I don't usually do nail art on both hands either! I get lazy and my right hand just gets a solid color. Sometimes my left thumb just gets a solid color too. these are so pretty! I need to practice my nail art, I love how you broke down the steps! Love this, you are so talented! These came out so well! Almost look like the sheswai bottles themselves! How cute! Such amazing cherry blossoms! I just saw the first picture and thought "what a gorgeous white!!" didn't know how much more pretty stuff was coming after that! Super cute! Cherry blossoms are my favorite! I gotta be honest, I can't even do dots on my non-dominant hand. It's so shameful!!!!! 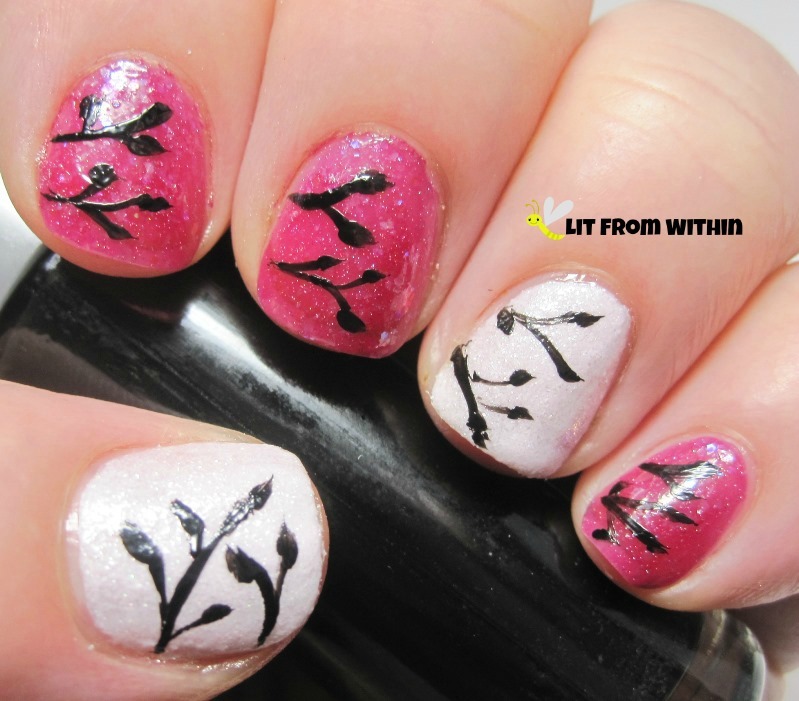 I like how your cherry blossoms turned out. So pretty, those turned out really well! There are a few cherry blossom trees on campus where I work, just gorgeous. Loved your cherry blossoms! Such a great Spring mani. Holy moly! This is a seriously pretty mani! You did a fantastic job!! And Cherry Blossom trees just scream spring, which is great because I think we're all over winter! Haha! Thanks for linking up! this is super cute! I love the colors you used and how it turned out! Your designs are absolutely gorgeous!